Bagaimana heroik nya anak Singa, mencoba menolong , seekor singa betina lain yg sedang ditembak dgn obat bius. Seekor anak singa di taman nasional perlindungan Kenya, tampak mencoba menolong singa betina yg sedang ditembak oleh obat bius penenang, tranquilezer dart. Seperti ditaman perlindungan lain di african, singa dlm kondisi populasi yg memprihatinkan, perang saudara yg bertahun2 tak ayal menjadikan mereka korban pemusnahan: dijadikan santapan, juga dagangan utk ditukar dgn amunisi, secara illegal masih tetap diburu,pemburu high class, dgn ditebus ribuan dollar masih bebas, layak nya olah raga berburu-mengejar menembak sampai mati, pemburu local, memanfaatkan jebakan kawat yg dipasang disemak2, sangat sederhana namun mematikan pelan2, kaki yg terjerat tak ayal putus, luka dsbnya, terkadang leher terikat mati lemas. cacat kaki, luka bagi hewan di alam liar adalah kematian, mereka tdk bisa berburu pun tak bisa bertahan dr kompetisi perkelahian sesama karnivora. bagaimana harimau kita? harimau jawa yg sdh lama punah, Sumatra? Was this heroic behavior or merely cat curiosity? A big cat expert explains. 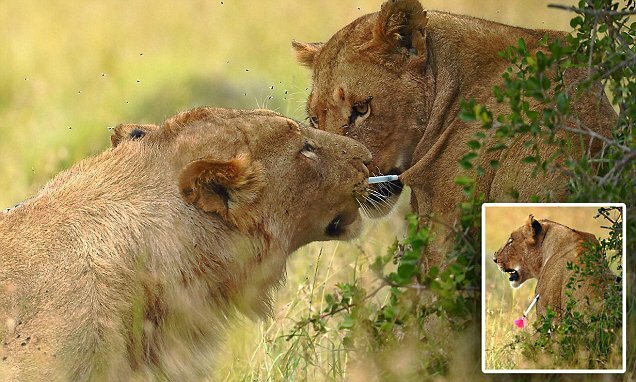 A young lion tries to pull out a tranquilizing dart from a lioness at Ol-Pejeta Conservancy in Kenya, about 125 miles (200 kilometers) north of Nairobi. A series of photos published Monday show a male lion pulling a tranquilizer dart from his companion’s shoulder at the Ol Pejeta Conservancy in Kenya. 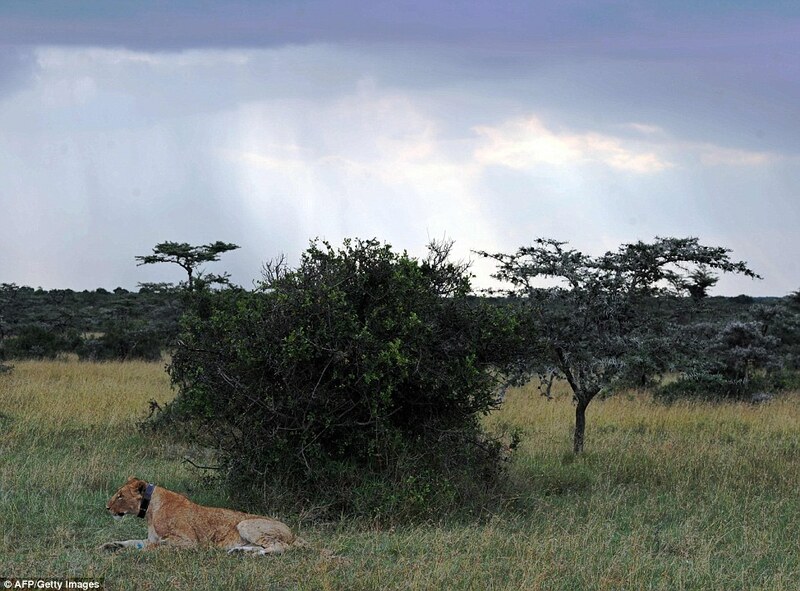 The lion was darted by a team of park rangers working for the Kenya Wildlife Service, who were reportedly subduing the animal to check her health and fit her with a radio tracking collar for further study. During the process, they treated her for a wounded paw. The photos reveal an uncommon behavior for the lions, so we asked Luke Dollar, a biologist and the program director for the National Geographic Society’s Big Cats Initiative, to help us make sense of it. He took a break from working with lions in Zambia to spend a few minutes talking with us about the photographs. Have you ever seen big cats behave this way? If anybody has watched a young cat play with a toy, they have seen a cat behave that way. 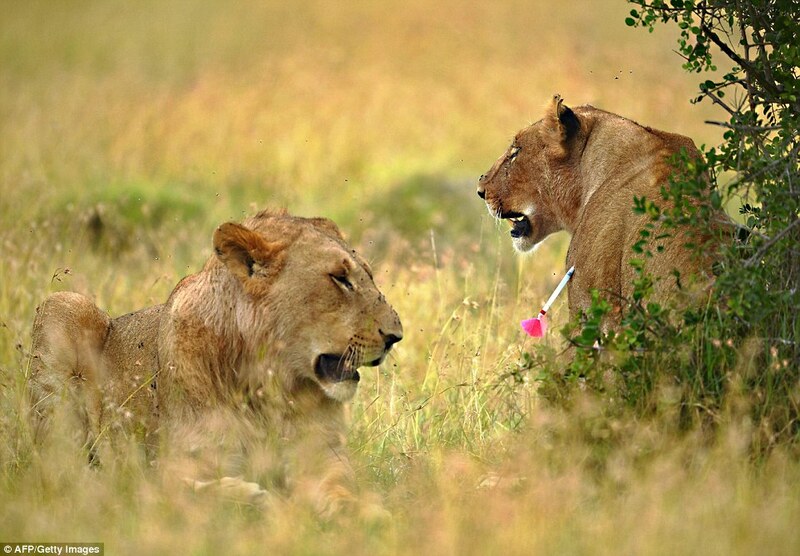 When a dart hits a lion, they will usually vocalize their discomfort and move; it is like getting stung by a wasp. When that happens, the other lions nearby will investigate, particularly if they are young and curious like the male in the photographs. A tranquilizer dart with a bright flight—the fanned end that helps stabilize the dart—will be especially enticing to a lion, like a bouncy cat toy. Lions hit by darts often behave as if they were stung by a wasp, says big cat scientist Luke Dollar. The young male is most likely displaying curiosity over the dart, says Dollar. So the photos only show a curious cat, nothing more? There is a strong social bond in the pride, but this is probably more curiosity than anything, particularly if they have been darted before and are habituated to the practice. Is this behavior common for all big cats? Most cats in this situation would explore, including your house cat. But lions are more social than other big cats; in fact, they are the only social big cats that live in groups. Lions form prides, which usually consist of five or six females, their cubs, and one or two males. Most other big cats—leopards, jaguars, and tigers, for example—are solitary. The lions’ great success is their social structure. 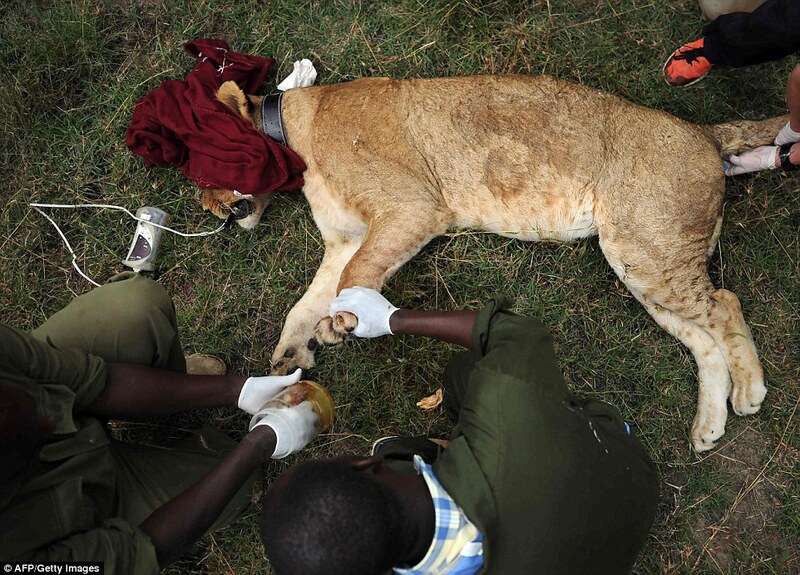 Wildlife vets inspect the lioness for injuries and disease as they set up a radio collar for monitoring. Can you describe the basic care for an animal with a wound like this? Without having been there, I can’t speculate on this specific instance, but I just helped dart a lion less than 48 hours ago in Zambia, so I have experience with this type of treatment. 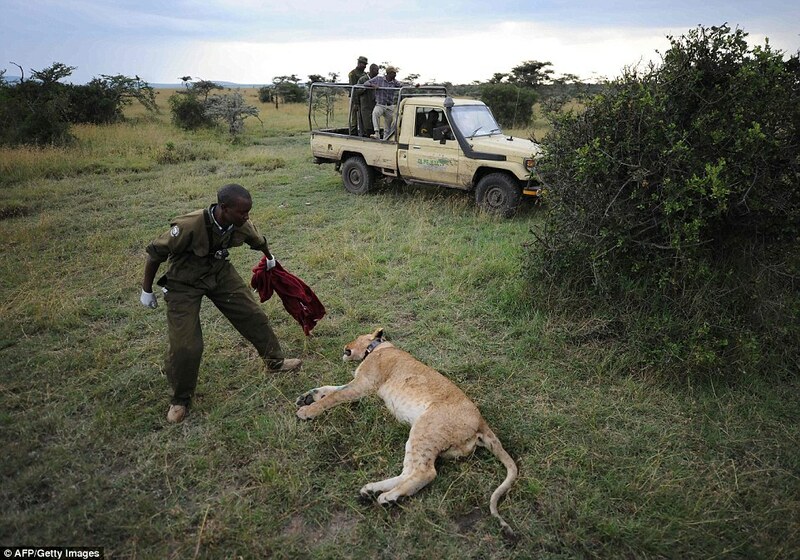 It depends on what drug(s) are used, but usually a lion is sedated within 10 to 20 minutes of being darted. The dart has a small barb to keep it from falling out, which is evident in the photos as the male tugs on the dart. It’s not a gruesome hook; it sticks in the skin and bounces there, and we remove it when it is sedated. The sedatives are usually a cocktail with a fast intake and a longer lasting drug that will last no longer than an hour, maybe an hour and a half. It is similar to the anesthesia used when spaying or neutering a pet. 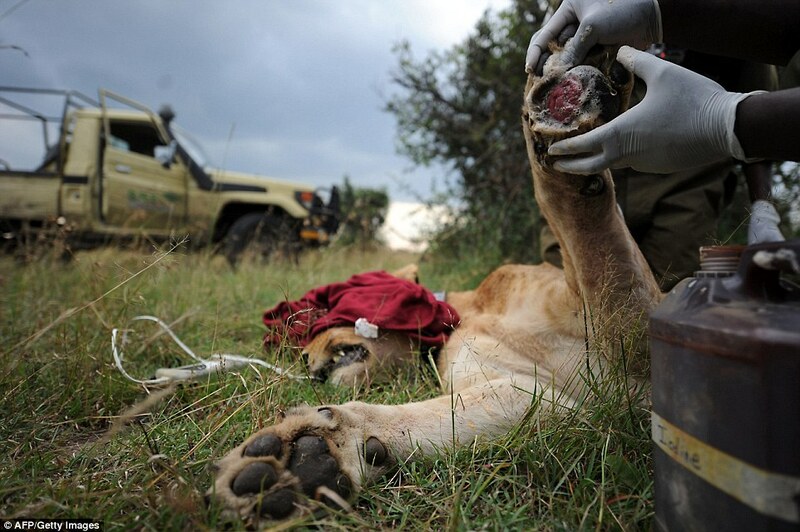 When the animal is out, the team will usually clean the wound and administer a medicated spray. For the wound shown in the photos, they would not likely bandage it or put a lampshade collar on it. If they have a vet, they may administer antibiotics, which is not an uncommon practice. Vets continue their examination of the big cat. 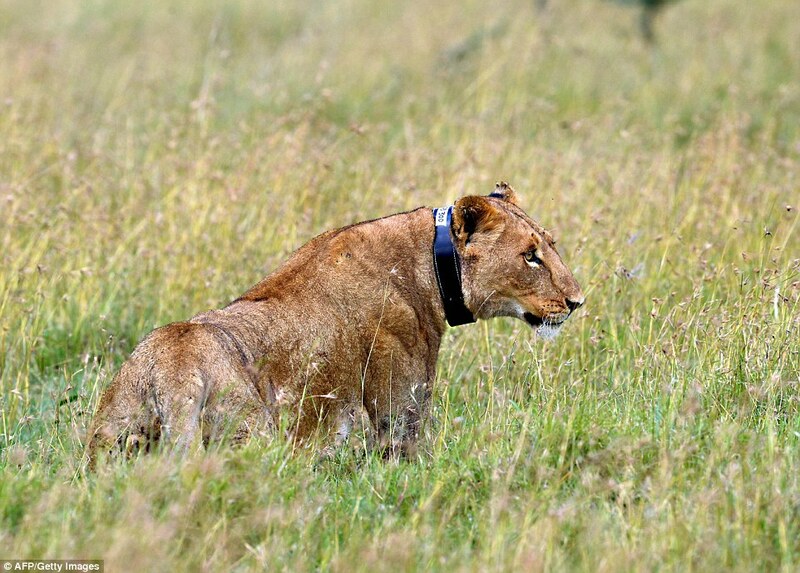 The lioness recovers from the effects of the tranquilizer, fitted with her new tracking collar. This entry was posted in Big Cats and tagged kucing besar, peduli harimau sumatra, singa peduli by bonny. Bookmark the permalink.